I’ve been saying for a long time now that the series is winding down. I have a few more ideas that I’d like to explore with it though before I end it entirely…if I ever do actually end it entirely. I think after I finish writing Invasion, which will be book 20 of the series, I’m going to take a break and write another book that’ll be entirely it’s own thing and have no connection to the series whatsoever. It’s the story about a girl who, after working a string of crappy convenience store jobs, goes to work as an assistant for a private investigator. There’s going to be quite a bit of humor in it, and I haven’t decided yet whether there’ll be a paranormal element to it or not. Right now I just have the beginning of it written, and it’s been sitting there collecting dust ever since. That’s why I think I’m going to go ahead and write that one after I finish Invasion, and then maybe come back to the series after that. Will this new one turn into a series of its own? I have no idea. I’ll just have to see how it goes. If it does, I may alternate back and forth until the Unseen Things series has reached it’s conclusion, whenever that happens to be. I introduced something in the last book that needs to be explored more, but Invasion isn’t the book to do it in, so we’ll see what happens. Anyway, those are my plans as of right now, and are as always subject to change. If I do decide to put that other book off for a while, I’ll announce that once the decision is made, but as of right now, my plans are to finally get it written. I literally woke up with that running through my head earlier. I don’t know where it came from or what I was dreaming about that triggered it, but there ya go. It’s not from any of my books or short stories and I have no use for it other than to post it here for general interest value, but I thought it worked nice as a personal quote. I figured as long as I was redesigning some of the other covers I wasn’t happy with, I might as well do this one too. I wasn’t really unhappy with this one so to speak. I actually liked it, but it seemed a bit spartan to me. This one is more representative of the story. I sort of debated whether or not to change it, because I really do like the old one, but I finally decided to freshen things up a bit with the new one. Now that I finally got this done, I can get back to writing my next one. The new cover is now, or will be updated soon on all of the retail sites, and here on the official site as well. 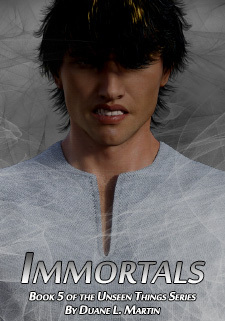 As promised, here is the new cover for book 5, Immortals. I was never happy with the original cover at all. It was cheap looking, had bad skin texture, etc… This new cover is basically the same design as the old cover, only it looks about a bazillion times better. The e-books have all been updated with the new covers wherever they’re available. The Smashwords premium sites like Barnes and Noble, Kobo, iTunes and others will be updating soon. I think this is the last cover I’ll be updating, as it was the last one I really wasn’t happy with. I may do a new cover for Origins eventually, but I’m not sure yet. I’ll have to see what I cam come up with. If I can come up with something better, I’ll update that one as well. If not, then this is it for now. I’ve never really been happy with the cover of book 2, so tonight I designed a new one for it that I like a lot better. The content of the book is unchanged. It simply has a much nicer looking cover now. I will probably redesign the cover for book 5 as well sooner rather than later since I’ve never been happy with that one either. As for book 20, the one I’m working on now, I’ve been having a lot of fun with it. Jake and Lana are the two characters I have the most fun writing, and I just finished the chapters where they had their first encounter with the Skinks, and then later had to take out a whole camp full of them using one of the cheapest, plans I could possibly come up with for them. I mean really, it was so cheap and dirty that it was just an absolute blast to write. I’m working on chapter 7 at the moment, so I still have about eight and a half chapters left to go. One thing that I’m definitely going to include in the book is the full story where Jake and Lana did a job for a guy and then ended up having to kill both him and his two young sons in order for he and Lana to be able to escape with their lives. It was a really bad situation and one that affected him deeply, and still does to this day. I ran through the whole thing in Travelers, but I’m going to do it in full detail in Invasion. Anyway, that’s it for now. 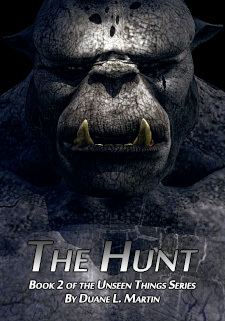 If and when I update the cover for book 5, I’ll post another update with it. I’m currently 25% done with writing Invasion, which is book 20 of the series. This one’s different than the other books though, and I’m finding it quite stimulating to write it this way. See, when I had the idea to tell Jake and Lana’s story from just before the Echnid invasion all the way up to the point where they headed out for Cottonwood, Utah, where they ended up in book 17 of the series (Travelers), I was planning on writing it as just a regular book about their experiences. However, just before I started writing it, I had an idea. That idea was to do something totally different than I’ve done with any of the other books, and that was to have them sitting around in the living room of their home with Derek, Jarrod, Tina and Sarah. They’re relating the story to them, and during the story parts it’s written as it happened. When it comes back to them in the present day, they keep getting interrupted by various people coming through the house. They also discuss various things in relation to the story, and ask Jake and Lana questions about the different things they’ve told them. So there’s a back and forth element to it that I feel works really well and that I’m exceedingly excited about, but there’s also various people coming through during the story just to illustrate that life continues on as normal outside of the story. I’m probably not explaining it all that well, but I haven’t had a lot of sleep, so I’m not exactly running on all cylinders at the moment. Suffice it to say that I’m really excited about what I’m doing, and I think it’ll make for a great read. As for my new year’s resolutions (since it’s January 1st today), I only have one. This year I’m gonna sell some damn books finally! How? I’m actually gonna start advertising instead of spending all my time writing. See, it’s funny how it all works. If people don’t know your books exist, they don’t buy them. I know…it’s crazy, right? Still, that’s something I need to put a whole lot more focus on. I always said I’d focus on advertising once I finished writing the series, but since I never seem to finish, I guess I’m just gonna have to make myself do it. Anyway, happy new year everyone! I’m gonna go and try to get some much needed sleep. It’s a gym night, and I’m gonna have a crappy workout if I don’t.